The "Take It!" 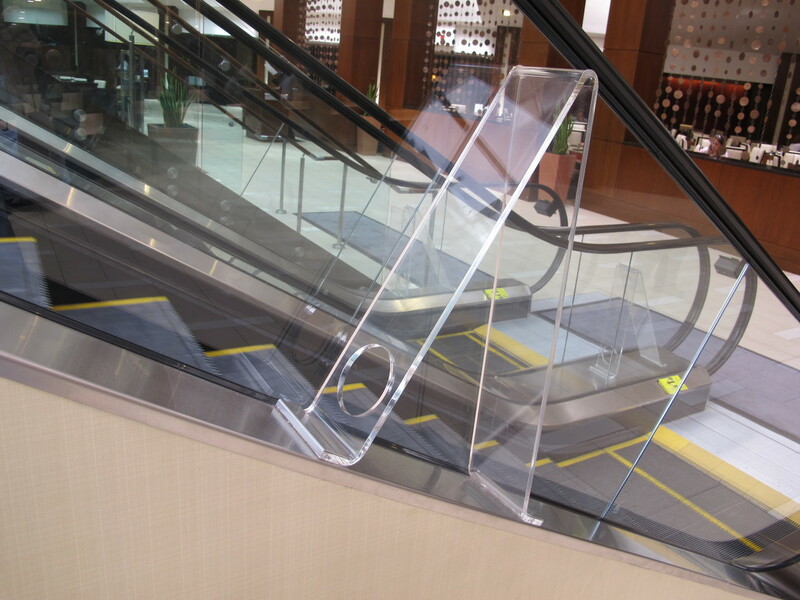 came after having looked at these plastic accessory pieces to the set of escalators for many years and not known what they were for. I have shown these photos to several staff in the hotel, and they too are baffled. 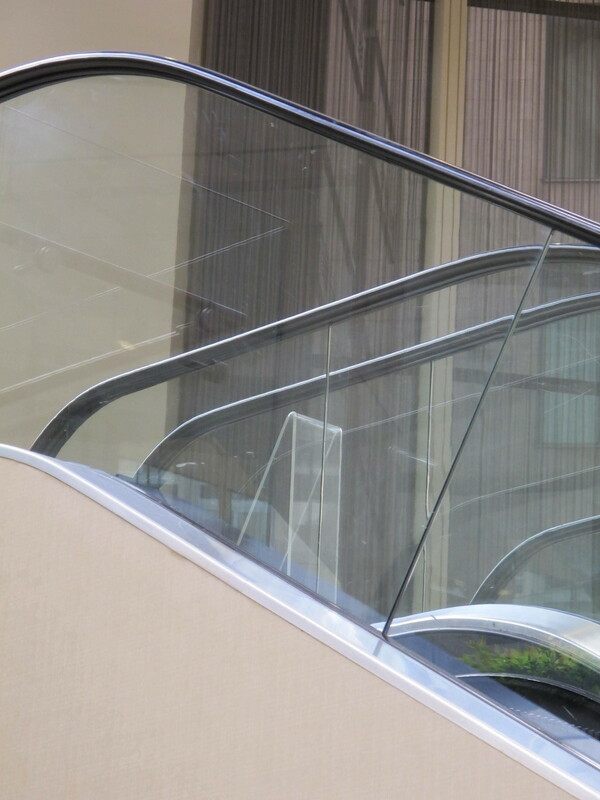 I even showed it to an escalator repair fellow in another hotel that was doing maintenance and he did not know either. The After Take: Is to make an exception to the usual presentation in eyelusions to present this vexer to you for a possible answer. I cannot wait for the set of answers that I feel certain are going to be sent. - lol. Wishing everyone a happy day. PS: I will keep questioning others - and just as soon as an answer is found - I will pass it along. This photo was taken at 12:14pm on June 25, 2013. The location was in a large upscale hotel in Crystal City, Virginia. The "Take It!" Came when I was walking through the lobby near the escalators and saw a staff fellow who was in the standard engineering department dark blue pants and shirt uniform. I watched him step onto the bottom step of the escalator and asked him the why for of the plastic pieces placed in between the escalator units. 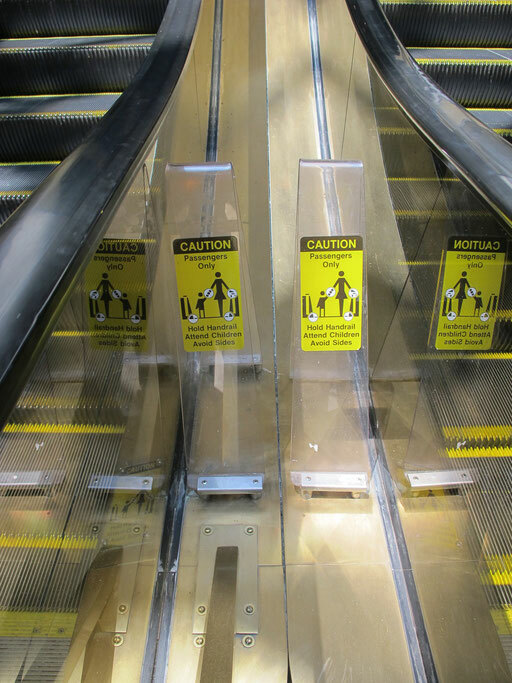 He quickly pointed to the printed placard that offers a warning to people with children who may be using the escalator to be careful with them - for getting off of them is difficult for small children. I thanked him and went on about my way. The After Thought: This has solved the mystery that was posed in the current eyelusion enough to leave it up as the answer for a short while then take it down and place it in the archive and post the next challenge. However - I wonder why the original location does not have the warning posted - and also - the reason for the hole in the bottom of the back side of the original still needs and answer - lol. Thanks to those who offered solutions - and also those who took the time to put in the time to ponder for an answer - even if it was for just a moment. Im with Jim, looks like a support. But a support with a cupholder. Wow, I have no clue what that is.